Thanksgiving is suppose to be a time to gather with your family and enjoy a delicious eco-meal, but for some of us it makes it hard to be thankful for the things you are thankful for when there is so much tension amongst the family. Whatever the reason for the tension help get rid of it by distracting everyone with these innovative recycled dinner items on your table. Who doesn't need a little pepper on their food? Try some freshly crushed pepper from this pepper grinder made with reclaimed wood by artist Cam Lavers. 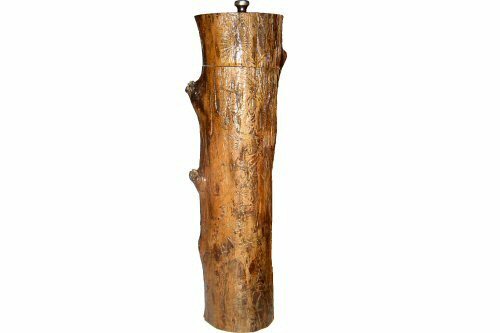 Each grinder is grinder is carved out of naturally fallen tree branches. Some lucky recipients may even have authentic beaver bites or deer bites on their grinder. Read how Cav Lavers started his eco-friendly pepper grinder business here. Also take a look at his eco-friendly tables. These elegant glasses are etched with dragonflies and are made from the top segment of reclaimed Napa Valley Zinfandel bottles. They are perfect for that organic wine you chose for dinner, especially for those bitter guests you know loosen up after a few drinks. The glasses are handmade in Wisconsin. These beautiful and unique bowls are made out of real fruits and vegetables in a very eco-friendly manner. The artist only uses food from local farms and composts or donates the rest to the zoo. She does not use any toxic chemicals in her work. This lovely dinnerware found at Natural Spaces is made from recycled glass bottles and jars by a U.S. company. The dinnerware is dishwasher safe but not microwaves safe. 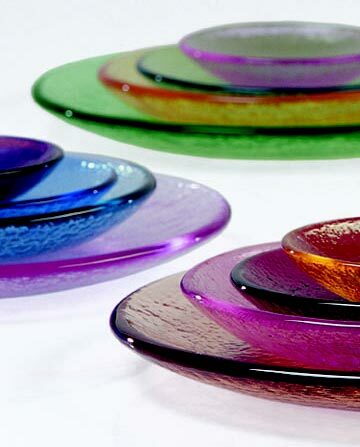 It comes in various bright colors including: cobalt, copper, plum, lavender, celery, aqua, citrus, olive and grape. Also take a look at Natural Space for recycled candleholders, vases and glasses. Jose Esteves artwork is beautiful. His elegant chandeliers are no exception. 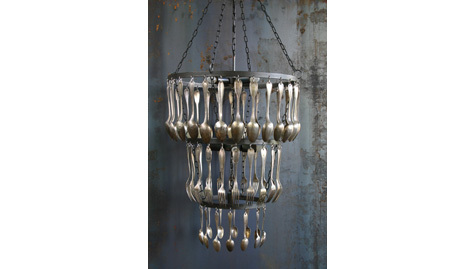 In his Brocante collection there are 3-tier, 1-tier and rectangular chandeliers made with vintage silverware. 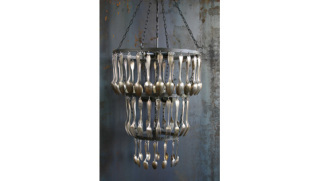 His chandeliers also have a hand patina finish and are made in France. 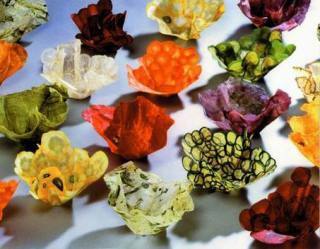 If you want to know more about Jose Esteves and his other work go to Interieurs . If you have any more ideas feel free to send them my way or put them in the comments sections. I hope this list is helpful and that it helps create new ideas for you to keep the peace this Thanksgiving Holiday. May you have a great one.